We dare you to go into the bathroom, shut off all the lights, look into the mirror and say "Bloody Mary" three times in a row. When you turn the lights back on, your face won't be staring back at you. Instead, you'll find a demonic woman with a blood saturated face in the mirror. Yup, you guessed it...it's Bloody Mary! You've most likely heard the famous urban legend about Bloody Mary. Over 100 years ago there was a witch practicing black magic. When the townspeople found out of her wicked ways, they murdered her and now her spirit haunts anyone who dares to call her name. Now you can bring this infamous urban legend to life by dressing as the vengeful witch. Everyone will take one look at your bloody eyes and they'll think that the woman from the folklore tale is alive and looking for her next victim. Blood-curdling screams will ensue! 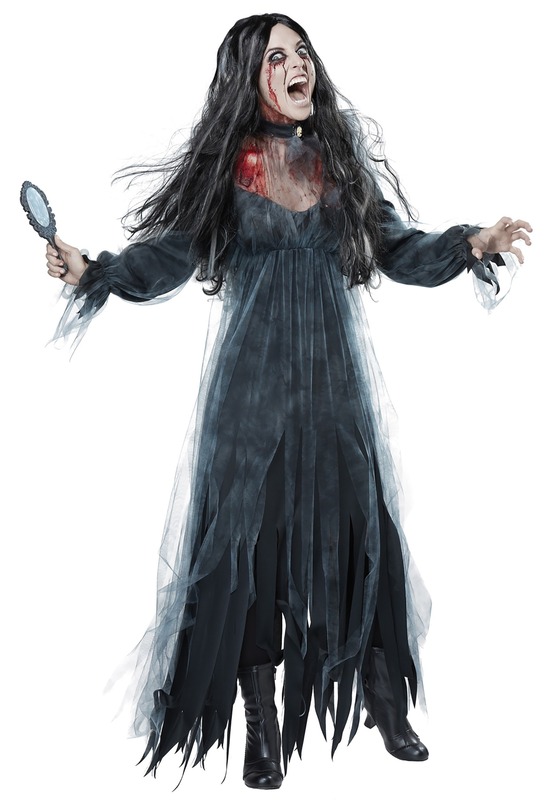 And, for now, you can be the haunter rather than the haunted by stepping into this Adult Bloody Mary costume. It is a great costume option for someone looking for a great scary costume that is familiar to many. The black long sleeve dress is tattered on the ends and the sleeves. A clear fabric is attached to the dress and comes up around the neck. A Victorian choker necklace gives this costume the proper finishing touch. You'll want a long black wig with gray stripes and lots of fake blood makeup. Make sure to put the blood running down your eyes. You could be as bloody as you want so you can distribute the makeup as generously as you deem fit. After all, you are dressed as the one and only Bloody Mary, the woman that has inspired a ton of nightmares and spawned an urban legend that is still being recited at sleepovers all around the world!